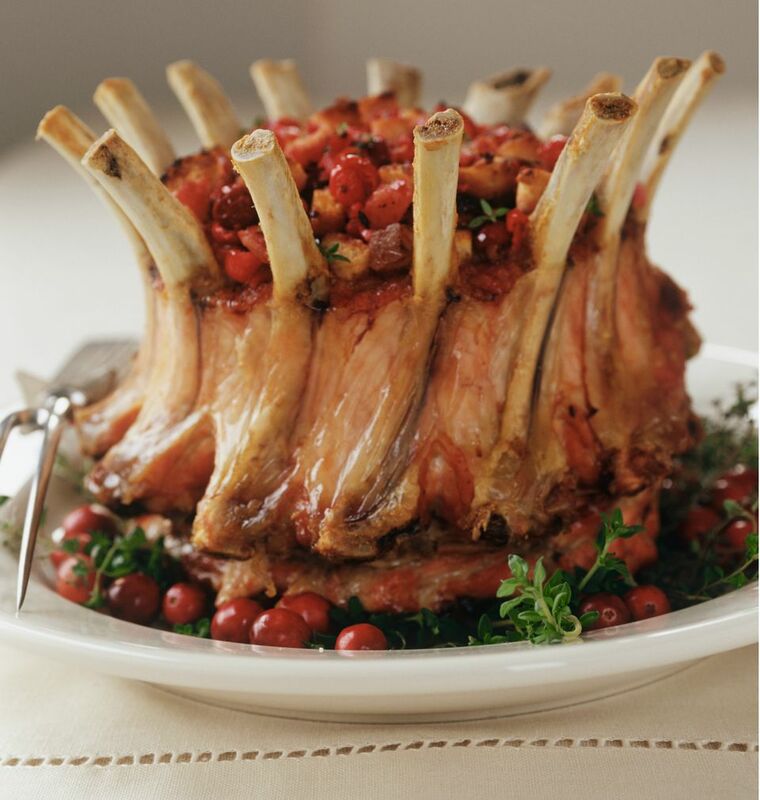 A crown roast or pork recipe with diced apples, herbs, and optional dried cranberries makes a striking main course for any holiday feast. Your butcher might have the frills for the bone tips, or you might be able to find them in a kitchen or housewares store. You might have to order this roast ahead of time, so check with your grocery store's meat department or butcher to make sure you can get one in time for your dinner. Heat butter in a large skillet over medium-low add the chopped onion, celery, apples, and chopped dried cranberries. Cook, stirring, for about 5 to 8 minutes. Remove from heat; stir in brown sugar, hot water, lemon juice, salt, sage or poultry seasoning, and bread cubes. Fill the crown of the roast with stuffing, heaping in the center. Cover stuffing with a piece of foil to prevent drying out and wrap ends of each bone with a small piece of foil. Roast at 325 F for about 2 1/2 to 3 1/2 hours, or until the meat registers about 155 F on a meat thermometer inserted into the center of the meat, not touching bone. Let the roast rest for 20 to 25 minutes before carving. Remove foil. If desired, decorate tips with paper frills.